On the occasion of World Literacy Day, the Annual Rotary Inter School Quiz Competition was held at Hotel TSG Emerald View on Saturday, the 10th Sept, 2011. Altogether 11 Schools participated in this annual event. The Rotary Club presented with a Rolling Trophy to the winning school Kendriya Vidhyalaya-2, the 1st Runner-up was bagged by Vivekananda Kendra Vidyalaya and the 2nd runner- up was Carmel Senior Secondary School. The students were presented with Prizes and Certificates. The Assistant Director, Education Department Shri Ayyaraju was the Chief Guest of the function, speaking on the occasion he congratulated the students and also lauded the club for the well organized program. The Quiz was very nicely conducted by Rtn. Abhijit Agarwal. Rtn. Zakir Jadwet, President and Rtn. 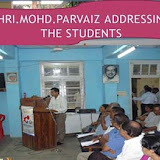 Girish Arora, Secretary along with members of the Rotary Club of Port Blair were present to encourage the students and oversee the successful conduct of the event.